New Jersey may be painted a deep Democratic blue, but the Democratic incumbent is no shoo-in for re-election. That’s because this year is unlike other years, and this senator is unlike others. 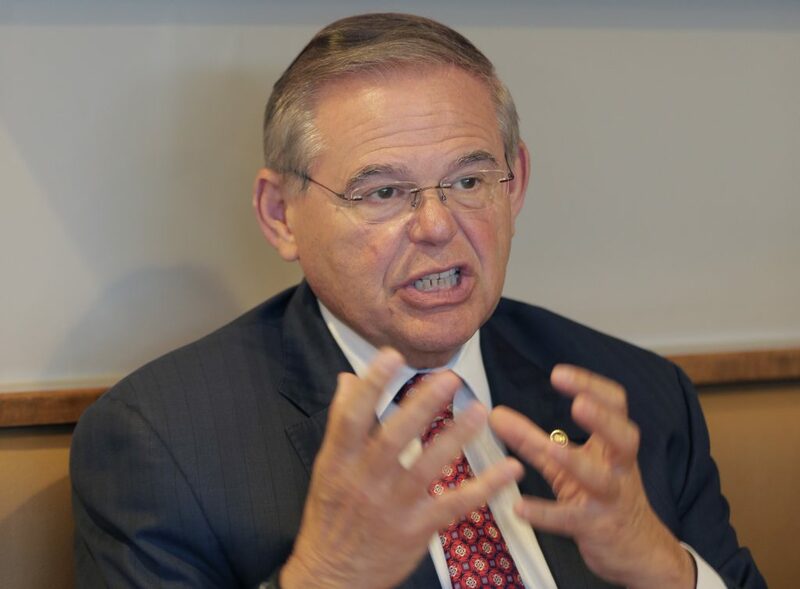 Sen. Bob Menendez, who spoke to Hamodia by telephone, is in a brutal political fight against his GOP rival, Robert Hugin, forcing Democrats to pour cash badly needed in other races into this race. Polls show the race has closed from a double-digit lead for Menendez to single digits. A top reason centers on the 2015 corruption indictment against Menendez which ended in a mistrial in 2017. Prosecutors dropped the charges in 2018. When President Trump withdrew from [the deal], you said that doing so will endanger Israel. How would you have handled it differently? Yeah. Well, the deal is as bad today as it was when I spoke out and voted against it originally. My concern is that bringing Iran to where we wanted to bring it, which is to cripple its economy in a way that makes it renegotiate the JCPOA (the official name for the nuclear accord) and also to change its course on other nefarious activities, like the violation of the arms embargo, its intercontinental ballistic development, the destabilization of the region in Syria, in Yemen, in Lebanon, it’s still the largest state sponsor of terrorism. All those things we must address as well. And so what I had hoped the Trump administration — and when the former National Security Advisor was there, he asked me to share thoughts with him, which I did, I went to the White House — is that we should have created a coalition with our European partners first to join them in creating a multilateral sanctions against Iran for all these other nefarious activities. That would have affected Iran’s economy pretty negatively, and then that would have put them in a position where we would be better able to then also insist on dealing with the sunset questions of the JCPOA. So that’s why I am worried that while, yes, the agreement was bad and I never supported it, that just walking away without anybody else in the coalition doesn’t produce the full effect that we need. You’re saying that it could have been done better, but you supported the concept of withdrawing from it. In other words, if Obama would have withdrawn from it, you would have supported that. Yes. Well, at the end of the day, the idea is to withdraw from it but to ultimately be able to bring Iran to stop its course of action. Withdrawing from it alone does not stop Iran from its course of action, and that’s what I’m concerned about. There’s not a full strategy as to how you get Iran to change its course of action, whether it be about the nuclear issue, or whether it be about its other malign activities. You’re saying that you don’t see Iran changing its activities based on the current administration’s policies and reimposing sanctions. You have to remember, those sanctions that I helped write and I was the author of, and then we worked to multilateralize, ultimately brought Iran to the negotiating table. So bringing back sanctions unilaterally, yes, will have a consequence, but it won’t have the full consequence of the world working with us as it did originally. And so that’s what I’m concerned about, that we won’t get the ultimate benefit of what we want, which is to stop Iran from its march to nuclear weapons and to stop it also in its other nefarious activities that I mentioned before. Do you think Israeli officials would agree with what you’re saying, perhaps behind closed doors? Listen, I don’t like to betray the confidences that I have, either when I visit Israel or when they visit me here, but Israeli officials don’t always say in public what they say in private. And that includes on this issue. I’m curious as to how you get your reputation as one of Israel’s closest friends in the Senate. I even have a quote from your opponent that he’s not going to try to “out-Israel” you. Was this because you have a lot of Jewish constituents in New Jersey? Do you have anything in your past? Well, for 26 years — including 13 years that I was in the House of Representatives where I had a congressional district that had far more Palestinians and Arabs than members of the Jewish community, so my politics would have been different, then, if this was about politics— it has always been about principle; a principled view that it’s in the national interest and security of the United States to have a strong, unwavering relationship with the state of Israel, the one true democracy in a sea of autocracy, a major security ally of the United States, a significant trading partner of the United States, and the one country most likely to be in common cause with us on international forums. And that’s why I’ve been such a strong advocate. Now, I fell in love with Israel when I first visited in 1992, and I saw a country where I went from Tel Aviv to Jerusalem in about 45 minutes on a good day. I flew the width of the country in three minutes on a helicopter and saw it surrounded by neighbors who did not want it to exist. I saw a government that is democratic and a Knesset that rivals the Congress in its activities. I saw a supreme court that very often overturns the government’s decisions and is abided by. I saw a country that allowed me as a Christian to be able to visit all the holy sites that are meaningful to me as easily as any Jew can visit the Western Wall, and that was not always the case until Israel had administration of all of those sites. And I saw a country whose people turned the desert green, and who had won Nobel Prizes and made risks for peace. And so I said, this is a country that shares not only our views but our values, and that’s why I had been such a strong advocate. Is there any reason why in the past few years, so few members of your party see it as you do? Well, you know, I differ with that. If I could just rephrase that, I’m not questioning the Democratic party’s alliance with Israel, but they’re willing to draw the line based on Israel’s treatments of the Palestinians. On the other hand, you’ll find that Republicans are willing to go all out with Israel. Yeah. Well, look. I think even the Trump Administration has said that it supports a two-state solution. I recently met with Jared Kushner and Jason Greenblatt to get a sense of where they’re headed on their mission. And while I don’t know all the specifics of their plan yet, because they’re still not ready to announce it, I got a sense of where they’re headed and what they’re trying to accomplish, and certainly, those are worthy goals. But at the end of the day, for Israel to be democratic and Jewish — and I do believe it should be a Jewish state — it needs to have a two-state solution, otherwise it will be overwhelmed by the population reality. So I think it’s in everybody’s mutual interest to find a pathway forward. Now, for that, you need a partner in peace, and that’s one of the challenges we have here: We have not had a true partner in peace. How we develop that partnership I think is an increasingly important question in the days ahead. Regarding health care, you were a strong supporter of Obamacare. Where do you see health care in the United States in another five or 10 years from now? Will it will be changed? Tweaked? Do you think it’ll be completely remade? I view the Affordable Care Act, which I helped write as a member of the Senate Finance Committee, as a foundation from which to build upon a greater health-care system. For a million New Jerseyans, they now have health insurance when they didn’t have it before because of the Affordable Care Act. For 3.8 million New Jerseyans who have a pre-existing condition, they can no longer be discriminated against because of the Affordable Care Act. For all of those not only New Jerseyans, but Americans, who previously had a lifetime cap on their insurance and may have had a significant illness and were one illness away from bankruptcy, they don’t have to fear that anymore. So those are things that I think are positive. Changing our health-care system from one that is disease-based to one that is preventative is incredibly important for the health of our people, and also for the cost to the system. So I think this is a building block. I’ve never believed that it is a perfect world, by any stretch of the imagination. One of the things we have to do is to create a greater affordability in prescription drug costs, which are driving our costs up wildly. I have a very different view than my opponent, who basically made a killing off of cancer patients and gouged them by over 200 percent. I’ve been fighting for creating more affordable drugs, creating greater opportunity for generics that hit the marketplace, which are cheaper and as effective as the patent drugs. For example, I believe that there should be an opportunity for a public option in the exchange that exists. I believe that individuals at 55 should be able to buy into Medicare, which is proven as a successful health-care delivery system. These are things that I think we can do to expand the universe and create greater accessibly and affordability. Some of the things you mentioned are supported by both parties. The question is, what’s going to happen next year when the individual mandate is repealed? Studies have shown that more than 50 percent of people in the marketplace will leave it, once they no longer have the fine for not having insurance. How will all this be paid for? Well, look: Insurance is about spreading risk, whether it’s the Affordable Care Act or anything else. Remember what happened before the Affordable Care Act. We had annual, double-digit premium increases by the private health insurance market and less choices, more restrictions, and they told us what we could and couldn’t do with our doctors. So changing that was important. The effort here is growing the pool, because unless you grow the pool and make the risk more extended and therefore bring down costs, the smaller the pool — if you have only the sickest in the pool, then you will have extraordinary cost. So the question is, how do we build upon those models? From my perspective, how we deal with the mandate, one of the reasons that we have a problem is because the Trump administration has been undermining the law and not providing for the cost-sharing payments that lower the cost. They’re driving the costs up. As we speak, they’re in a federal court having the Department of Justice argue that the law is unconstitutional. Well, if that succeeds, everybody who has insurance under the Affordable Care Act will lose it across the country, no one will be protected against pre-existing conditions, and there will be no more guarantees of being able to claim your insurance needs, because you’ll have a lifetime cap again. That’s just some of the problems that will happen. So I think we need to work together to expand the universe and spread the risk, which will lower the cost. I want to talk a little bit about the bipartisanship in the country. Obviously in the past couple of weeks with the Kavanaugh confirmation hearings, it really showed that you have half the country believing one person, the other half believing another person based solely on do they have an R or a D after their name. What do you think could be done to bring the country together again? First of all, I think the president needs to be more of a uniter-in-chief than a divider-in-chief, and I wish that he acted that way. Even if I disagree with him on any given policy, I would at least hope that he would seek to bring the country together in so many different ways. When he made the remarks in Charlottesville that there are good people on all sides, I don’t believe that to be true. I don’t believe that white supremacists and KKK and other entities like that are good people. We in the Congress need to do what I have had a great success in doing, which is working with Republicans in order to achieve critical legislation into law to improve the lives of our people. That’s how, in the state that has the highest rate of autism in the nation, I got the Autism Cares legislation passed and signed into law. I was working with a Republican colleague in Wyoming. That’s how I got to pass sanctions on Russia, working with the late John McCain and Lindsey Graham. That’s how I ultimately dealt with flood insurance, which is so important in a coastal state like New Jersey, working with my Republican colleagues from North Dakota and Louisiana. And I could go down a long list. When we do that, we do the nation’s best work. Because not only do we do it in a bipartisan way, we’re negotiating and we’re creating a balanced approach to some of these critical issues, and that’s normally the best way in which we move the country forward. While I deeply disagreed with Kavanaugh, I voted against him when he was nominated for the D.C. Court of Appeals, I have seen his decisions in writings since then — before the allegations — on civil rights, on voting rights, on immigration issues, and I don’t agree with him on that, so that’s why I opposed him. After your trial ended, you said, I quote, “To those who are digging my political grave so they could jump into my seat, I know who you are, and I won’t forget you.” Were you referring to local New Jersey politicians, or perhaps someone in the Justice Department? At the time, I was referring to political opportunists and opponents in New Jersey. Can you address speculation at the time that the charges were brought against you by the Obama Justice Department because you opposed the Iran deal? You know, I just will say that I believe that the charges were unjustified — as was determined by a federal court judge who exonerated me of the most significant charges; 11 out of 13 average New Jerseyans who not only didn’t believe in one element of the government’s case but several of them criticized it for bringing the case; and a Republican Department of Justice that dropped it all. I think that speaks volumes of the nature of the case and how it was brought.